Sitting in the Idyllic south Shropshire village of Habberley, is the stunning Grade II Listed Old Rectory a wonderful Tudor style rectory, with a fantastic modern twist. It boasts five large double bedrooms all with their own individual charm, a fabulous open plan kitchen breakfast area with stunning views of the Shropshire Hills (an Area of Outstanding Natural Beauty). The three reception rooms ooze character and with approximately five acres of south facing gardens and grounds and a 17th Century tithe barn, this property truly is something special. The owners have lovingly and sympathetically restored and extended this impressive family home. It has been finished to a very high standard, whilst retaining much of its period charm, four wood burning stoves, sash windows, exposed beams, parquet flooring all add to the character of this fabulous property. The Old Rectory sits in the centre of Habberley, opposite the local church and close to the village hall and public house. It is just a twenty-minute drive to the county town of Shrewsbury and just minutes to the pretty village of Pontesbury, which provides an excellent range of facilities including a well renowned family run deli and general stores providing high quality, mostly locally sourced produce. There are also excellent Public Houses and eateries with other local facilities including a Doctor's Surgery, Florist and DIY store. Excellent state and independent schools are within easy reach, as is access to the A5 and M54. The local countryside is regarded by many as the most scenic part of the county with delightful country walks, equestrian and other country pursuits all being available nearby. It really is an Idyllic spot. Cloakroom - Finished to a high standard including walk-in storage, wooden panelling (which is reflected in the other bathrooms throughout the property) white pedestal hand basin, low flush wc and skylight. Kitchen / Breakfast Room - 7.42m x 5.84m (24'4" x 19'2") - This is also a wonderful new addition to the property and works beautifully, blending seamlessly with the older parts of the house. This area is extremely spacious with the south facing light pouring in through the large, wooden bi-fold glazed doors. It comprises of a fabulous country cottage style kitchen, including a tiled floor, fitted painted wooden kitchen units, light granite surfaces, a stunning cream four oven Aga, a double Belfast sink, integrated dishwasher, and space for a large fridge freezer and a fantastic central island with breakfast bar and fitted circular stainless-steel sink. There is plenty of cupboard and storage space and a window overlooking the rear garden. There is a spacious open-plan dining area with room for a large table with wonderful views of the surrounding hills. Utility Room - 3.99m x 3.28m (13'1" x 10'9") - This was the original kitchen, with ample storage, pretty country style matching units, countersunk sink, a double Range style cooker with stainless steel splash back and extractor fan, plumbing for washing machine/dryer and window overlooking front courtyard with original quarry style flooring. Master Suite / Bedroom 1 - 5.84m x 4.88m (19'2" x 16'0") - The modern MASTER SUITE comprising of its own landing area, an elegant bathroom with white suite, wooden panelling and walk-in shower is finished to a very high standard. Leading through to a large, bright, and spacious bedroom with fitted wardrobes, and useful storage area under the eaves, with double aspect windows overlooking the front court yard and back gardens adding to the charm of this delightful room. Sitting Room - 6.02m x 3.91m (19'9" x 12'10") - This room has a wonderful elegant, timeless feel, with its log burning stove, beautiful bay window (recently replaced) and fabulous deep cornicing and skirtings. A truly lovely room. The side hall then continues to the MAIN HALL AREA, offering character and charm in abundance with its beautiful flooring, exposed beams, and original windows (these all have secondary glazing in this area). It also comprises two log burning stoves, one in the rear part of the hall and one at the front, creating a wonderfully cozy feel. Good ceiling height, windows overlooking front and side gardens. Dining Room - 5.99m x 3.81m (19'8" x 12'6") - In many ways reflecting the sitting room with its elegant feel, deep cornicing and skirtings, original open fire place and French doors (recently replaced) opening on to the south facing terrace. A fabulous entertaining room. Study - 4.42m x 4.22m (14'6" x 13'10") - An attractive room with exposed beam, parquet flooring, log burning stove with pretty surround. Tudor style window overlooking front garden with a charming alcove. The main hallway area leads around to THE FRONT HALL with wooden front door, a walk-in coat room, under stairs storage and log burning stove. The impressive wooden staircase leads up to the front FIRST FLOOR LANDING, with exposed beams and Tudor style window overlooking front garden. Family Bathroom - This room enjoys all the charm and character of its period but with a fabulous modern twist. Wooden panelling, exposed beams, walk-in airing cupboard, a modern white suite with walk-in shower, wc, pedestal hand basin and roll top bath, tiled floor, and heated towel rail, all finished to a high standard. The large rear landing has an original fire place and exposed beams, off which lead three large double bedrooms. Bedroom 2 - 6.05m x 3.91m (19'10" x 12'10") - Overlooking the rear gardens and grounds, with large (recently replaced) sash window allowing the south facing light to pour in, original fireplace, high ceiling and built in wardrobes. A spacious and elegant room. Bedroom 3 - 5.05m x 3.89m (16'7" x 12'9") - Also overlooking the rear gardens and grounds via the rather lovely sash window, includes walk-in wardrobe and oozes elegance and style. Bedroom 4 - 4.27m x 3.56m (14'0" x 11'8") - Is a slightly smaller room, however, still a good double. This room has more of a period feel with window overlooking the front garden. Bedroom 5 - 5.00m' x 4.85m' (16'5' x 15'11') - This large double is a pretty room with two sets of windows looking out to the rear of the property, soaking up the lovely views. 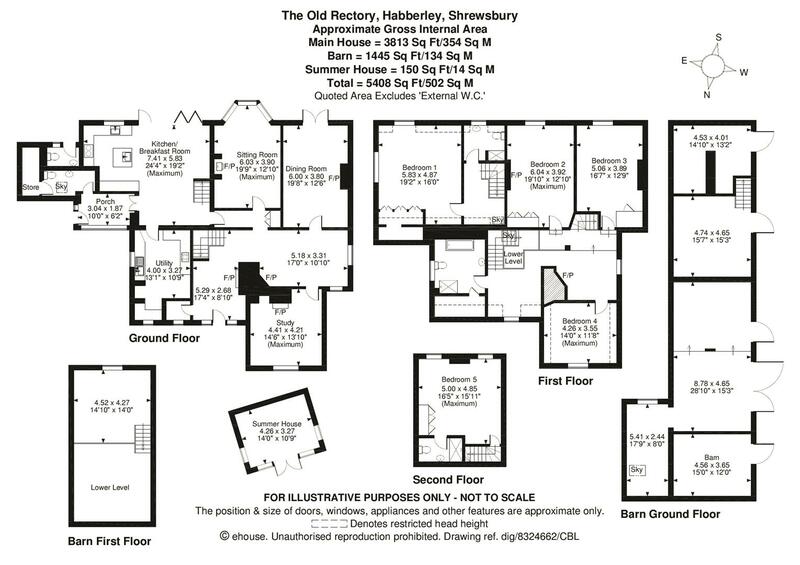 Built in wardrobes and EN SUITE including walk-in shower, wc, pedestal hand basin, white suite. Summary - This is a large, elegant home where old meets new seamlessly. Mixed with an abundance of original features, sympathetically dressed, chic, light, bright and airy. Finished to a very high standard, it truly is a beautiful, quality home of immense charm. Barn - There is a 17th Century tithe barn, currently used as a double garage, workshop and storage area. This listed building also has access to it from the other side and has planning permission for conversion. Adding versatility to this already diverse property. (please see attached floor plan). Outside - The south facing GARDENS AND GROUNDS extend to approximately five acres in total, with well-established trees and shrubs and a lovely sun terrace providing a wonderful entertaining area and a fantastic sun trap. There is a storage shed by the barn and an Idyllic SUMMER HOUSE positioned in just the right spot to catch the afternoon sun. There is a handy outside GARDENERS CLOAKROOM with white low flush wc and pedestal hand basin. At the bottom of the gardens sit two paddocks, offering even more versatility to this property. A pretty babbling brook and a wooden foot bridge lead to a wooded area with seating and a gate opening into the larger paddock approximately 3 acres in all surrounded by stunning views of the Shropshire Hills. A rear gate leads out onto the lane, providing separate access, perfect for riding. A wooden shelter is situated on the edge of the paddock. The grounds, gardens and setting of this property really are something special - Viewing is highly recommended. How To Get There - When approaching from Shrewsbury take the A488 (Pontesbury/Bishops Castle Road) and proceed through the village of Hanwood. Continue through Lea Cross and into Pontesbury. Pass the Nags Head public house on the right-hand side and continue a little further into the village, before turning left, signposted Habberley. Continue this road into the village of Habberley, where The Old Rectory will be found on the right-hand side, opposite the church. We understand that mains water and electricity are connected. Private drainage and Oil-fired central heating. The kitchen enjoys extensive views of the garden and hills beyond. The current owners like to settle around the table with friends and family after an invigorating country walk and share a hearty meal which has been waiting for them in the bottom oven of the Aga. The cosy drawing room is south facing and is always full of natural light. It's the perfect place to retire in the evening in front of the log burner. The Old Rectory is set in a very unique area. It's quiet, peaceful and tranquil, yet close to everything required for day to day living. The current owners will miss living in the attractive, friendly village and the surrounding countryside but their children have moved on and they feel that it's time to hand over to the next generation to enjoy everything that the house and location has to offer.